0.95-inch beautiful HD color screen, 2.5D full touched curved screen, comfortable to wear and easy to operate. Heart rate monitoring technology with innovative structure design and AI intelligent heart rate algorithm, continuous real-time measurement. At the same time, equipped with IR (infrared light) technology. Adopt sleep technology, under real-time monitoring, sleep breathing quality and big data analysis, accurately identify 6 types of typical sleep problems, provide 200+ suggestions for improvement and personalized sleep services. Built-in low-power independent GPS, support long-distance running for 7 hours. 8 sports modes, it can record the movement track and calorie consumption even without a mobile phone. Support 50 meters waterproof, bath, rain, car wash, and other conditions, identify your swimming position, record calories, strokes, speed, stroke frequency, distance, average SWOLF, etc. Many useful functions, such as remote control mobile phone to take pictures, looking for mobile phones, strange number identification, call rejection, WeChat QQ and other software information reminders, you will not miss important information. Simple and lightweight, detachable strap, skin-friendly material for a more comfortable wearing. Support for subsequent version upgrades. 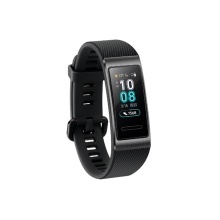 Download the "Heart Health Research" app in the HUAWEI application market, join the Heart Health Research Program, and use the service HUAWEI Band 3 with HUAWEI/Honor mobile phone (support Android 5.0 and above). The data and results are for reference only. According to the ISO 22810-2010, it supports 50 meters waterproof. For iOS system phones, it does not support card opening and recharging. Strange number recognition only supports phones with EMUI4.0 and above. Remote control camera only supports HUAWEI EMUI 8.1 and above, using the camera of mobile phone to take photos. These data are the test results in the laboratory standard environment, please refer to the actual use.